First, you should be sure to read my last post: "Social media - It's time to pay attention and yes, learn one more new thing." As I've mentioned, I have become a big fan of the "mutually beneficial" side of social media - the ability to share what others have done, and seeing others share what I've done. I welcome that change from many types of research, where the important thing is to differentiate your work from other researchers who are writing about similar topics. Social media allows me to write about the same events and topics as others, and become part of a larger conversation. I've even brought life to a previously written report by tying to a new conversation. All of a sudden, that PhD dissertation or research report that is relevant to a story in the news today can be shared with an entirely new audience. An added bonus is that I can share and comment on the work of colleagues that I find interesting - I can help spread the word about their work. The biggest outlet that I've found is at public meetings and roundtable events. Inevitably, we all have thoughts that we didn't get a chance to share at a public meeting or event. Sometimes, we share good thoughts at the meeting, but wish that we could share those thoughts with others who weren't there. it's great to pull out my mobile device and share those thoughts with my followers. Some are afraid of social media - including several of the people we would most like to hear from. As a native Washingtonian, I'm a fan of the Tony Kornheiser radio show - he's a former columnist for the Washington Post's Style and Sports section and has many opinions that make for an entertaining twitter feed. However, he recently shared an opinion on-air that many of my policy colleagues have shared with me privately: the fear that if he had a Twitter account, he would be fired from his job within a very short timeframe for sharing something that crossed a line for his bosses. This is a particular concern for anyone who represents an organization in some way. I represent several organizations, so this was a large concern for me at first. Two steps are important for policy people using social media who desire to stay on the good side of the legal folks and their employers. First, when not officially speaking on behalf of an organization, have clear disclaimer language. You can see my disclaimer for this site on the side of the screen, and on my twitter bio, I include the following phrase "Views:my own. Follows & RTs ≠ endorsement" which means that I am speaking for myself and I don't necessarily endorse any statements of others, merely because I am "following" their account or sharing what someone has said. Second, treat every message on social media as if you were giving an informal public speech and Q and A. This may seem burdensome at first, but it's a matter of training oneself about what kinds of things to share. When I give a speech, I know that I am speaking to a self-selected audience of people who are interested in what I want to share, but I also know that there are reporters in the audience and that anything that I say could end up shared with anyone. The same thing is true of social media, except sharing is much easier. When I get into my "public speech mindset," I know that I can share my opinion, and keep it light every once in a while, but I keep some of those opinions to myself. If there's an issue that might cause trouble, I stay away from it. If I disagree with the official position of any of the organizations that I represent on an issue, you won't read about it here. It took a while to figure out how to bite my tongue when appropriate, but once I started treating each post as public, it became easy. The key to both personal and professional use of social media is filtering. I mean this on multiple levels - you need to learn to filter what you are putting out there and you should use filters to manage what's coming in. This changes for everyone, depending on what they want to share and who they work for. I filter what I share on @DrUrbanPolicy, but my friends hear more about my favorite restaurant or my gameday reactions to the latest football game elsewhere. Some chose to blend their social and professional lives completely into one account and one outlet - the key there is to remember that you are speaking to friends, family, colleagues and strangers all at the same time. You should be filtering to share the things that are appropriate for your entire audience to hear (whoever that audience is). On a site like Facebook, privacy settings allow you to share certain things with certain groups - it's a useful thing to do, and I am surprised by how few do it. Most other sites are best assumed to be for the general public: one can have a private Twitter account, but that defeats the purpose - you are on Twitter professionally to bring more attention to your work. once you set your mental filter for "general public," the same way that you would when making a speech, you should be ok. Equally important is filtering what comes in. Lists on Twitter are crucial (you can see mine at https://twitter.com/DrUrbanPolicy/lists). What these do is allow you to group twitter feeds into something manageable. 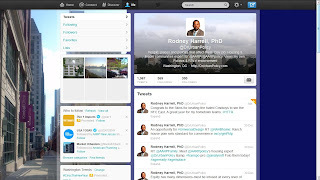 once you are following more than a few dozen accounts, twitter can become overwhelming. Lists allow you to put everyone that talks about anything, say housing issues, into one group, and you can read their recent tweets when you want to know what's going on in housing. Currently, I have about 20 lists (some people are on more than one), and I know that I can check in on any topic t any point in time to see what's going on. Also useful is twitter's ability to subscribe to other's lists - you don't even have to come up with the list yourself. With all social media, make sure to only receive the notifications that you want to receive, especially if you have multiple devices. The constant stream of notifications can be overwhelming, especially if your phone is buzzing every few minutes with something that you don't have time to pay attention to. Don't be afraid to go to Twitter's notifications page or the one on Facebook to limit what you are receiving. You should control social media - don't let it control you. To those who haven't tried - why not reserve your name and experiment with twitter? I want to se more colleagues out there – why prevent your thoughts from getting out? 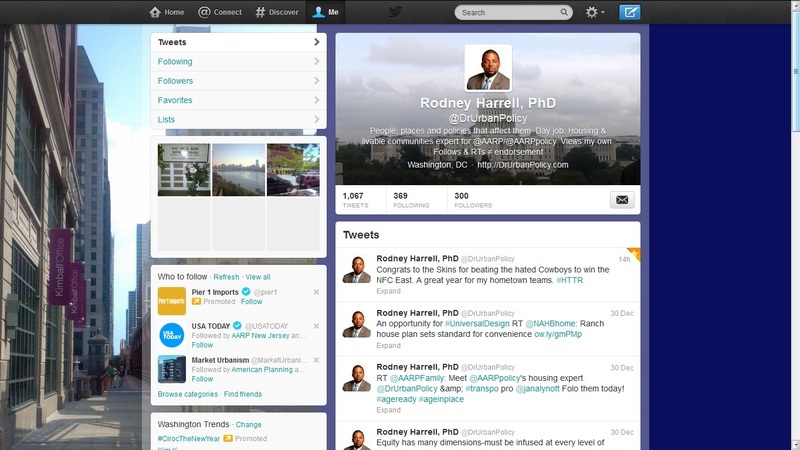 Do you have any thoughts on ways to use Twitter successfully for policy audiences? Don't keep them to yourself, share with the group by leaving a comment below or @DrUrbanPolicy.